Bevel type mud agitator is an ideal type of agitator to maximum it’s torque and agitating performance by a same size motor compares worm type mud agitator. Worm type agitator is well used in drilling solids control system because of cost effective, but bevel type agitator is better performance and minimum footprint space. 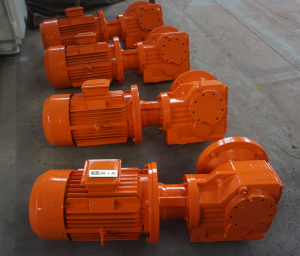 So many client will prefer bevel type gear box instead of worm type because of it’s advantages bellowing. Bevel type gear box is higher torque to maximum agitating strength by a same size motor and impeller. Very small footprint compares worm type gear box, so the agitator is lower to allow a higher mud tank for more mud storage capacity and flexible installation. Higher price compares the worm type gear. Easier installation because small size of gear box and no coupler, worm type agitator will require a coupler to protect equipment. Many worm type agitator without coupler can be supplied but it is not a good option to protect equipment. Other than bevel type mud agitator, AIPU supply worm type agitator and vertical agitator for options to suit different buyer request to consider working performance, equipment foot print and cost budget as well as delivery time. Please contact us freely in future for inquiry.